However, one night earlier in the week I got up around midnight and my fabric was calling out. I have several projects laid out on the cutting table and I can’t wait to have time to work on them. I decided to respond to the call! I worked this morning a bit as well, connecting the pieces to form my strips. I’ll have this block done before dinner tonight! It is also no secret that I love Fig Tree stuff. I tend to hoard and not actually use my precuts for some reason. Stupid really, since I love it so much – why not make it into something I can enjoy every day -right? I was inspired by a post from Sherri McConnell of A Quilting Life blog who also does a lot of stitching for Joanna Figueroa and she had made a wall hanging from her Canned Pears pattern. You can (click here) to visit that blog post. I really loved seeing it done that way, and I decided that I could adapt it to be a nice window valance hanging for my kitchen window, perhaps with a roman shade layered behind it. Anyway … I wanted 5 pears to go across the valance, in a staggered fashion like the quilt pattern. But the pears are too big, so I had to draw out my own dimensions for the pieces to make it fit. My challenge was to make my initial pear block out of charm squares from the new Mirabelle fabric collection from Fig Tree. Therefore, I have two different fabrics for the pear body, but I think I will like it when it is all done. Right now, it might may it look a little more like a vase or jar, instead of a pear, but I have high hopes! I reduced the size down by about a third. She’s my Christmas Eve rescue baby. She looks very healthy and all adapted to her purrever home now though! And two more of my rescue babies, … Sparkle and Jewelry (taking a bath, so she’s a bit blurry). Having their morning naps. Always close by. See that quilt they are on? 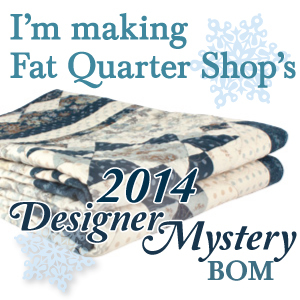 It is the backside of a 2011 FQS Designer Mystery quilt. Quilt police confession – I start using my quilts even before I have the binding on. I just make sure there is a stay stitch around the edge. I procrastinate really bad on bindings! I love the fabric you have chosen for your Great Granny Squared blocks. I was up at 3AM on Friday morning and thought it perfectly reasonable to go to my sewing room if I wasn’t going to sleep!!! LOL. Your kitties are adorable and your rescue looks like a real beauty! Confession! I use my quilts before they’re bound too. I also love Fig Tree, and tend to hoard my precuts.